Remember days behind the old school desk? If it was any good your school would have had a Progressive Music Society held in a Sixth Form Tutor Room blagged off of a Physics Teacher named Mr Bowden who was really good at rugby and mainly mutilated the school First Fifteen during the school versus staff match. It is fair to say we ganged up on him and the maths teacher, a Welsh fellow called Mr Cox who insisted on wearing glasses, much to his downfall. There was a gangly teacher called Mr Jowett, another maths teacher, who was akin to a Daddy Long Legs who we all kept away from as serious injury would occur if you tackled him, he’d have your eye out with those knees, but, as far as I know, none had any interest in the following subject matter. Well luckily we did and it was run by a fine fellow, if I remember correctly, a year above us called Steve Clark. He was a quiet fast-moving demon and ran a lunchtime session that involved a room, which I seem to think, backed onto the Quad, a place only permitted to be used by the Sixth Form. He had an explosive hairdo in common with Marc Boland and zoomed here, there and everywhere. One of his inaugural lunchtime sessions included playing Tyrannosaurus Rex (who ended up being T-Rex). Thinking about it now that explained his barnet. He challenged the status quo of Mr Nutt (although I feel he may have had a ‘K’), the music teacher, who produced the school operas to the delight of the Crawford Arms and in which my first love, a certain beauty called Susan Gee usually starred. I was smitten and sent her a note and flowers but I am now starting to digress. The Radcliffe Progressive Music Society became an institution. I first came across it in 1969 when I was in the second or third form and a rather insignificant junior nurd. This was because in 1968 Radio Luxemborg broadcast ‘In-a-Gadda-da-Vida’ by Iron Butterfly late one night in its wholesome and we went to Northampton’s Lever Records and bought it the next day having listened to it in the dorm on a trannie (wish I hadn’t writ that) under heavy bedclothes. Now, if I remember correctly the Progressive Music Society started that year or the next and as I had a copy and I offered it to Steve who played it at the next session, probably ‘69. The summers and days rolled on and every day became a music festival. Anyway I am starting to waffle. It is Atom Heart Mother we are about to discuss which was, I think, released in late 1970 on the Harvest Label. It was neither good, not good, exceptional or really head down hair shaking but it was rather different. Steve, or was it Stephen, played it one lunchtime and all gathered were rather perslexed, or should that be perplexed? It went on….and on…until Alan’s Psychedelic Breakfast completely fugged the mind. In fairness it did have some liveliness and smiley bits that one still awaits with anticipation like the motorbike starting up and riding across the room and ‘Silence in the Studio’. It was different but not that different, in my mind, to Gadda as it had a memorable riff that ran through the main track and no-one knew what it was about. It stayed in my mind and bits are found secreted away in future Pink Floyd albums if you pay enough attention, so maybe it is actually quite significant. Fast forward a few hundred years then. Our Bazzer, a native of (and Oxford scholar) informs us that there is this DJ called David Freeman who is about to move house and discovers, under his bed, some old quadraphonic studio demos of Dark Side of the Moon recorded on 8-track cartridges. This is all pre-cassette players. It then transpires, he tells me, that he going to play this archaic recording at Blackwell's, the well-established bookshop in Oxford’s Broad Street in the best kept secret of Oxford, the Norrington Room. Actually the views from the toilets on the fifth floor are equally impressive. Fortunately he’d already bought the tickets at a heady fiver each and it was great. The Norrington Room is a sunken area in the bowels of the bookshop surrounded by a gallery and it is where the legal and more heady science books live but there are lighter tomes lurking about. The ceiling is akin to the Albert Hall but in reverse and it is well cool. The area had had the tables moved about and there was a scattering of Assembly Hall chairs and worn comfy ones. One table had been devoted to selling bottles of Alan’s Remarkable Ale. David gave a brief and entertaining presentation on the history of the 8-Track and on cue one by The Carpenters demonstrated its ability to disgorge its tape. Everyone of a certain age can remember, I’m sure, seeing miles of 8-track tape festooning the hedgerows of Britain. The four huge and sensitive speakers meant it didn’t matter where or how you sat and the reproduction was as clear as the day it was made. It was, I have to say pretty powerful and made me smile for the members of the Prog Rock Soc. At the end, after thanking everyone for coming, especially some members of the Fifth Form, David suggested that he might play Atom Heart Mother at a later date and possibly Tubular Bells in the future. Well a watch was kept on the Blackwells website and sure enough he was true to his word. We put our names down immediately. 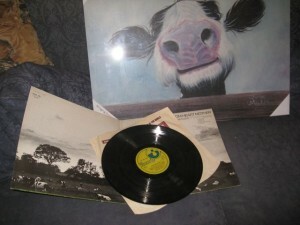 One wet and windy Pork Pie Friday we got around to discussing the experience with Seager Stewpot and happened to mention that Atom Heart Mother was next up. Only turns out it is all time favourite Desert Island disc and he has little or no fond memories as a result of his brain being diluted at the time of hearing and seeing it played live in Hyde Park so he was added to the guest list and went home to cancel his passengers. A bit disappointingly David had another commitment but was there to introduce the piece via the wonders of the ether. Atom Heart Mother was the first quadraphonic recording of a Pink Floyd album and appeared in LP and eight track form under the Quad-8 brand, so we sallied forth into a very different take on the album without him. 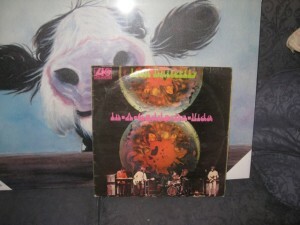 The multi-coloured light show swung into sixties splendour and we were off on Side A, ‘Atom Heart Mother’. Supposedly named on a whim, as the album didn’t have a title, allegedly as a result of the headlines of the day which were about a mother who had had an atomic heart fitted. 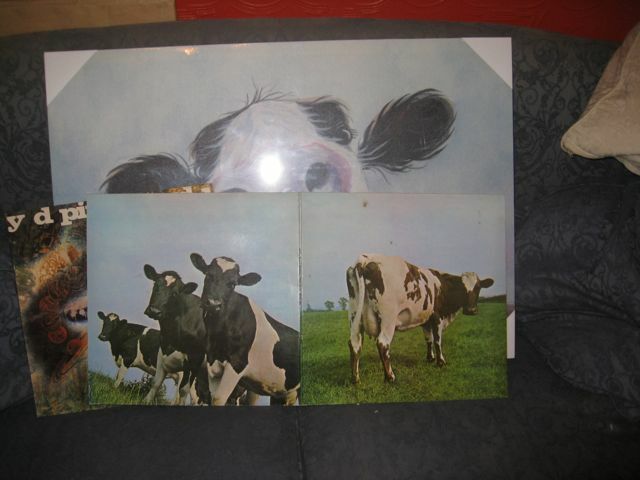 Whether any of that is true is neither here nor there as is the lack of reason the album cover features cows, apart from one sub-track a called ‘Breasty Milk’ and another ‘Funky Dung’. The technology of the day meant no splicing was possible so the entire 23 minute piece was recorded in one hit by the band and takes up one side of the LP version. Now we could ramble on for hours about the history and meaning of it but there is so much on the interweb I’ll leave research up to you. For me it is all about summer and conflict and freedom. Galloping horses, a rolling riff and some pretty mixed up stuff including an orchestra and choir. It is strangely likeable. It did make number one in the UK album charts and was a huge success for Pink Floyd but they are still in two minds about it. Again rather than talk bollox about the music (you need to listen to a copy) Side One in quad stereo was a bit of a disappointment to be honest. I waited like a coiled spring for that ‘Daddy, my daddy” moment at the end of the Railway Children but when the motorbike started speaker left and drove across the Norrington room it was actually nowhere near as sudden or effective as heard on me Dynatron in stereo. It was also somewhat muted which was odd. Likewise the “Silence in the studio” before the piece goes into its final movement lacked the authority of the record player version. Perhaps it’s the quad making parts too clear or maybe the distortion with two-track makes it a lot more enjoyable. I can’t make my mind up. Course it may be I have eleven on the Dynatron. It being 8-track it was then straight into Side two. Each piece was written by a member of the band and is a mix of droll, happiness and hang-overs. In my opinion the best track is possibly ‘If’ written by Roger Waters if only because it’s a sing-a-long, it makes reference to a train and I actually really like the poetry lyrics. Wow man. If Atom Heart Mother itself was mildly down on points then’ Alan’s Psychedelic Breakfast’ went off the scale. It was a revelation in this format. From the car door closing, crunching gravel, the tap that drips throughout, sizzling bacon and ‘Snap, Crackle and Pop’ it was brilliant. The experience ended well, really well and as we helped return the classroom to its former glory everyone in the room reckoned it had been well worth the listen, even the Fifth Formers and do you what? No ones phone rang! Jane, Barry, Stewart and I stepped out into the still light Broad Street and watched a swiftly moving Mark Shem sail over in the Virgin balloon giving his passengers and enviable view of the spires of Oxford glowing yellow in the low sun. By the time we emerged from the Kings Arms there was a beautiful moon up. We’d had a lovely time and were all home by ten. Now that doesn’t happen everyday. The next Quad gig planned is to be another ‘lost’ tape this time Mike Oldfield’s Tubular Bells in 5.1 Surround Sound on October 31st kicking off at 19 o’clock. Halloween is chosen as it was, David tells us, the piece that William Friedkin chose to accompany his chilling movie 'The Exorcist'. If you’ve never been to Blackwells then you ‘ave missed a treat. If you want to dress up and get your beer half price, enjoy some nostalgia without being seen as sad and listen to music in a very special place then we’ll see you there. Far out babe. Fifth Formers and below welcome. For further information and get a ticket (£5 proceeds to Maggies) if the event hasn’t now been discovered click along to http://bookshop.blackwell.co.uk/stores/events/ and go to events or contact Blackwells tel: 01865 333623 or email events.oxford@blackwell.co.uk.